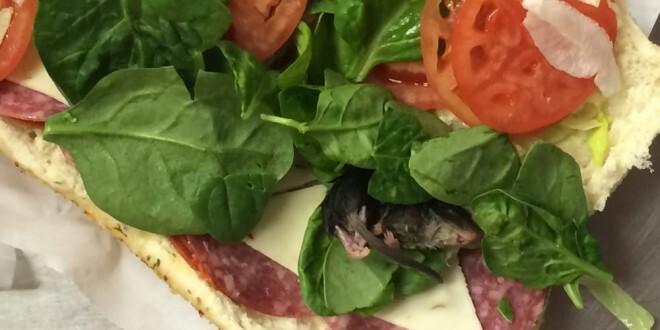 A Subway customer says he found a dead mouse in a sandwich at an Oregon restaurant. Jay Armstead and his friend Matt Jones went to a Subway in Lincoln City, Oregon last week and one of them got something quite unexpected in their sandwich. A dead mouse right there in the spinach. And while Jay was obviously a little shook too, Matt thought it was only gas. “It’s the funniest thing I’ve ever seen, but it’s also the most disgusting thing I’ve ever seen. I laughed because I was like, there is no way this just happened,” he said. The county health department have investigated and found that the rat came from the spinach suppliers and there was no risk to customers’ health. The pair got a full refund. Which, under the circumstances, is the least you could expect.